DOG FACTS - DID YOU KNOW? There is no law against dogs fouling public places, however people are becoming increasingly sensitive about it and there are specific rules within certain places, such as urban parks. There are restrictions on owning certain breeds of dog and potentially dangerous animals in Spain. Laws are regulated by the Autonomous Communities (Comunidades Autónomas), which impose a wide variety of rules and regulations within the country. All dog, cat and ferret owners in Andalucía are required to register their animals on the Animal Identification Registry of Andalucía (Registro Andaluz de Identificación Animal, RAIA). Owners have three months to register their pets, except for those with a potentially dangerous breed of dog who have one month to obtain the necessary licence. Any person owning a potentially dangerous dog (perros potencialmente peligrosos) in Spain must have an appropriate licence (by law of article 3 of the Royal Decree 287/2002, of 22 of March 2002) and the dog must be registered with the municipality. Handlers and walkers of dangerous or potentially dangerous dogs must also be licenced (article 1, 2 of Law 50/1999, of December 1999). A licence is valid for five years. UPDATE - May 2012 - The Junta de Andalucia has added Bull terriers, Presa Canarios, Napolitan mastiffs and Boxers to the list. These breeds cannot be taken out in public without a leash and muzzle and must be registered at the town hall. Dog owners or handlers must carry the licence and dog registration document when out with the dog. The dog must be muzzled and on a lead of no more than two metres long (one metre in Andalucia). Only one dog may be handled per person. In Andalucia, dangerous animals are banned from entering children's leisure or recreational areas. Note: In most municipalities, only one dog may be registered to one person. The property where the dogs are kept must be enclosed by a two metre high barrier. DOGS - have been man's pets for over 14,000 years. Dogs descended from the wolf family that roamed Europe, Asia, and North America. Scientists know that man and dogs have had a relationship for many years through their study of cave drawings, early pottery, and Asian ivory carvings. Housedogs, Shepherd dogs, Sporting dogs, War dogs, Dogs that ran by scent and Dogs that ran by sight. 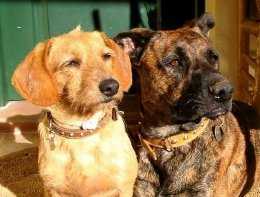 Dogs vary greatly from breed to breed. The smallest breed is the Chihuahua. It weighs only 4 pounds and is 5 inches high at the shoulders. The tallest breed is the Irish wolfhound. It is about thirty-nine inches tall at the shoulder. The St. Bernard is the heaviest dog. It can weigh about 200 pounds. The Yorkshire terrier has hair that can be two feet long while other breeds may have no hair at all such as the Mexican hairless. The fur may be curly or straight. Some dogs have two coats. The outer coat is long guard hairs and the undercoat is shorter and fluffy. These two coats protect the dog against rain and snow. Some dogs have a long muzzle while others have flat faces such as the Pug. Many breeds have pointed ears that stand up. Others and pendulous ears than hang down. Some dogs have long legs such as the greyhound. Others are extremely short such as the basset hound and the dachshund. The chow chow even has a black tongue. Even though all these dogs vary greatly in appearance, they are identical in anatomy. They have 321 bones and 42 permanent teeth. Most dogs are able to detect scents far better than humans. They can also hear high-pitched sounds. Dogs mature by six months old. The smaller breeds usually mature before the larger breeds. Female dogs have a period of six to twelve days approximately twice a year when they are ready to mate. This is known as the season of heat. Female dogs have a period of three weeks approximately twice a year, when they are ready to mate and the bleeding is from 6-12 days. This is known as being on heat. Puppies are born sixty-three days later. An average litter has three to six puppies. Puppies are born helpless. They are blind and cannot stand. They sleep ninety percent of the day and the other ten percent is spent nursing. Their eyes open about 13 to 15 days after birth. Between 4 to 10 weeks the puppies become attached to their mother and siblings. Puppies should not be separated from their mothers until they are eight weeks old. New puppies should be taken to a veterinarian for a physical examination and to be given vaccinations. The normal body temperature of a dog is 101.5º F. (38-39c) When a dog becomes too warm it sticks out its tongue and pants. Puppies should be feed three times a day. They should have plenty of fresh drinking water. Dogs should get exercise. Dogs need a clean sleeping box. This can be made with blankets or shredded paper. If your dog is an outside pet, he will need a warm doghouse with a dry, warm floor. The floor may be covered with cedar shavings, sawdust, or blankets. Outdoor dogs need shelter from the cold, rain, and sun. Indoor dogs must be taken outside regularly for elimination. Dogs with short coats need to be brushed once a week. Long haired dogs need daily grooming. Small dogs usually live twelve or more years while larger dogs have a shorter lifespan. When a puppy is six months old it should be spayed or neutered if it is a non-breeding dog. The normal body temperature of a dog is 101.5º F. When a dog becomes too warm it sticks out its tongue and pants. Dogs with short coats need to be brushed once a week. Longhaired dogs need daily grooming. Small dogs usually live twelve or more years while larger dogs have a shorter lifespan. TEETH AND GUM PROBLEMS - Dental problems , for example, often are not discovered without health examinations. In fact, veterinarians have found that by age 10, many dogs and cats that have not received dental care will lose some teeth to disease. Though common, teeth and gum disorders can be dangerous. When tartar builds on the teeth bacterial growth will develop and bacteria can enter the blood stream and seriously damage the kidneys, liver and heart valves. However, these health problems easily can be avoided if the pet receives annual health exams and regular dental cleaning. VACCINATION - Animals also should be vaccinated against several contagious and life-threatening viral diseases. A few of the more dangerous health threats are distemper, rabies, viral hepatitis, kennel cough, leptospirosis and parvovirus in dogs; and feline leukemia virus, rabies, flu, herpes and infectious peritonitis in cats. Cancer - What seems like a harmless bump on your pet's skin actually may be malignant skin tumor or cancer of the lymph nodes. If detected early, many tumors can be treated successfully with radiation, chemotherapy or surgery. FLEAS - If untreated, your pet may develop an allergic reaction to flea saliva. Fleas can transmit serious infections to the blood of cats. In severe itch, the animal may scratch its skin until it bleeds and secondary infections can occur. CARDIOVASCULAR PROBLEMS - Disorders causing heart murmurs or heart failure can be discovered, evaluated and treated. EAR INFECTIONS - Without medical care, ear disorders can cause hearing loss and chronic infections requiring surgery or ear canal reconstruction. TICKS - Aside from the blood loss and local irritation ticks can transmit several serious blood infections to dogs, cats and humans! Worms - Pets are especially vulnerable to worm infection in the spring, partly because of the increased contact with insects and other animals. Some parasites are transmitted through the faeces of infected animals or through carriers such as fleas, mice, birds and squirrels. Other worms can be passed from an infected mother to her puppies or kittens either before birth or while nursing. Heartworm, the most deadly parasite for dogs, is spread by mosquitoes. LEISHMANIOSIS - is a disease caused by a parasite (protozoa) called Leishmania Donovani. This disease is very common on the Costa del Sol. Investigations have suggested that a percentage of 5-35 % of all the dogs in the Mediterranean countries are be infected. The parasite is transmitted by a little mosquito (Phlebotoma) which is an inhabitant of the Costa del Sol. If a dog is stung by an infected mosquito, the parasite enters in the blood circulation and penetrates the white blood cells of the dog. These cells are a part of the immune-system and due to the infection the immune status of the dog weakens and makes the animal more susceptible to secondary infections. High levels of antibodies against Leishmania in the bloodstream cause damage and inflammation in the tissues. Catalan Sheepdogs range in size from 18 to 20 in (46 to 51 cm) in height and 45 to 60 lb (20 to 27 kg) in weight for males, with females being smaller. Their coat is long and either flat or slightly wavy, and can be from fawn to dark sable and light to dark grey. 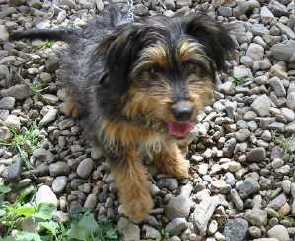 There is also a shorthaired version of this breed, but is nearly extinct. Bodeguero -The Ratonero Bodeguero Andaluz (literally, the Andalusian Wine Cellars' Ratting Dog) is a Spanish terrier. It is believed to be descended from Fox Terriers crossed with other small breeds. This cross was probably during the XIX century, when many British businessmen established in Jerez to deal with Sherry. Its Spanish name reflects its main occupation: hunting rats hidden between Sherry barrels. Appearance - The dog is of medium stature, with a short but abundant mostly white coat with black and/or tan markings. The head should be black and triangular with a semi-flat skull, with very dark eyes and folded ears. The tail may be docked to one quarter of its length or natural. is a native to the region of Estremadura in Spain. He was for some time popular in that county. He is believed to originate from the ancient Molosser dog that can be traced back to 2000 years B.C. These dogs were probably introduced to the Iberian Peninsula by Phoenician tradesmen who had brought them from Syria or India. Mastiffs have been known to exist in Iberian for thousands of years, and the Spanish Mastiff was shown regularly at dog shows early this century, however, no Standard for the breed was drawn up until 1946. The Spanish Mastiff is a natural guard, and his inherent abilities led him many crossing with other breeds to perfect the lesser breed's type. It is popular in Spain as a guard of both livestock and the home. One of the dog world's truly great droolers, this old breed still guards sheep, as it has done for centuries. The Spanish Shepherd's Association, Mesta, records how this bulky breed has been an efficient protector against wolves since the 1400's. Today a lot of individuals are kept as companions. The breed may be seen in great numbers at Spanish dog shows but is still rarely seen outside the Iberian Peninsula. The Spanish Mastiff is the national dog breed of Spain and is now the most numerous of all the native Spanish dog breeds in that country, currently around 24000 Spanish Mastiffs live in Spain. The province of Leon in northwestern Spain has the largest Spanish Mastiff population in the country, particularly in the mountains. Leon is now known as the Spanish Mastiff capital. Even though the Mastin Espanol (Spanish Mastiff) is a very rare breed in other countries, this is a very popular dog in his native Spain. In fact, the breed is almost as common there as the Labrador Retriever is in North America. Some of the finest, pure bred, show-quality Spanish Mastiff stock can be found in both the Madrid-region of Spain and in Holland and MECA (the Mastin Espanol Club of America). The MECA is now importing and breeding stock from those regions to work towards improving the Spanish Mastiff bloodlines in North America and educating the public on the breed. However, Holland is more recommended, because in Spain, they are more likely to sell you a pet-quality dog. Some of the Spanish Mastiff's talents include watch dogging, guarding, police work, military work, tracking and hunting. The Spanish Mastiff is the father of the Portuguese Rafeiro do Alentejo and has played a role in the ancestry and development of some other Mastiff breeds such as the St. Bernard, Dogo Argentino, the recently created Asian Shepherd and possibly some others Molosser breeds known today. The breed has suffered from extensive crossbreeding with foreign Mastiff breeds, such as the St. Bernard and others, during the past few decades, which caused a big decline in the numbers of purebred specimens. But the Mastin is now back to its pure form. The Spanish Mastiff should be 28-35 inches tall. Males should weigh 185-220 pounds, females should be 145-170 pounds. Health concerns in the breed include hip dysplasia, heart problems and Entropion (inversion of the eye lids). Also pano-ostiosis (growing pains), which occurs when they are growing puppies. This breed is also prone to bloat. It is wise to feed the Spanish Mastiff several small meals rather than one big one. Births are difficult in some Spanish Mastiffs and C-cections are often needed. Do not allow the Spanish Mastiff to over exert them selves, such as, jumping, running and going up and down stairs, when it is a puppy. The reason is; this is a very fast growing breed (in a period between 6 and 8 months old, they can easily put on 100 lb.). It needs to save time and energy to develop healthy bones, muscles and tendons. When fully mature, this breed has an average need for exercise. Like all giant dogs, this breed is very slow to mature, especially the males which keep growing up until 2.5 to 4 years of age and it is rather short-lived. They have a fairly low activity level and needs only a moderate amount of exercise. You should also be aware that this breed drools and slobbers and may snore loudly. Breed Status: The Podenco Andaluz is a nationally recognized purebred in its native country of Spain. Distribution: The Podenco Andaluz is common in the Andalusian region of Spain, although it is growing in numbers in other parts of the country as well. 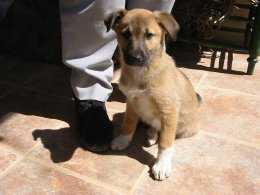 Some members of the breed have also been exported to other countries including the United States and Greece. Etymology: Podenco Andaluz translates from Spanish as Andalusian Warren Dog, refering to the breed's area of origin in Andaluz and for its role as a rabbit hunter. Personality and Uses: The Podenco Andaluz is considered a specialist in the hunting of hare, rabbit, and wild boar due to its natural instincts, remarkable sense of smell, and abundant stamina. This is not to say that this is all the breed is capable of however. The Podenco Andaluz is also able to serve as a retriever, both on the land, and in the case of ducks, in the water. Pyrenean Mountain Dog - The male weighs in at about 100-130 pounds (45 kilograms), while females are 85-115 pounds (39 kilograms). The Pyrenean Mountain Dog's fur is often white shades of grey or tan around the face, ears and sometimes on the body. Only one in four will have a pure white coat. The Spanish Greyhound is an ancient breed of dog, specifically a member of the sighthound family. The Spanish Greyhound inhabited the Iberian Peninsula 400–600 B.C.E. This dog breed was probably a result of the dogs brought by the Gauls on their migration through the peninsula mixed with dogs brought by traders who did business with the Gauls. In the intervening centuries, it is likely that other sight hound breeds were interbred to produce the Galgo that we know today. Despite being called a "Spanish Greyhound", the Galgo is not a true Greyhound. The lineages of the two breeds are different. However, in the last century or so, some breeders have cross-bred Galgos and Greyhounds in order to produce faster Galgos. The Spanish Greyhound are unfortunately bred in large numbers by unscrupulous breeders, who then kill them in the most barbaric ways possible- hanging, burning, battering, shooting, or throwing them from a moving car. It is estimated that about 50,000 are killed each year, although some sources say 100,000 is the more likely number. Water dogs - Although the Spanish Water Dog, or Perro de agua español, is an ancient breed that traces back many centuries, it was first officially recognized in Spain in early 1980s. It is believed to have been introduced by the Turks who traded in sheep and used them as sheepdogs, but the exact origin of the breed is a pure speculation. In Spain he has been known under many names, the 'Andalusian Turk', or Turcos Andaluces being most common. Spanish Water Dog's coat is curly when short, and can form cords when long (almost like Puli's coat), although it does not grow long enough to touch the ground. The puppies always are born with curly hair. Traditionally, the SWD's tail is docked or naturally bobbed. Spanish Water Dogs become very attached to one person, but they also do well in family situations and with children. The breed was recognized by the Real Sociedad Central de Fomento de Razas Caninas en España in 1995. While these dogs can still be found working in the mountains of southern Andalucia herding goat and sheep as they have been for the last 1000 years, the breed has taken on new jobs in today's society: search and rescue, drug and bomb detection. Insuring your pet in Spain has been notoriously difficult. At first only an accident insurance covering the claims if your dog caused an accident or bit someone was available, but it now seems the type of insurance a lot of expats are used to from our own countries are also available here in Spain. For dog insurance in Spain, you are unlike to get cover if your dog is the type of dog that should be registered on the Dangerous Dogs Act 1991 or types known as Pit Bull Terrier, Japanese Tosa, Dogo Argentino, Sharpei, Fila Brazileiro, Wolves of Wolf hybrids will not be accepted for cover. Also if you dog is used as a guard dog or for racing, no matter the breed, you might be exempt. Another thing that many pet owners coming to Spain might not be aware of is the fact that your pet will not be covered for Leishmaniasis, also known as sand fly disease. Pets suffering from this can live quite long, but only if they are being treated with various medications. Also to avoid be exempt for cover, you must also arrange for your pet to be vaccinated against the following and to keep up the vaccinations. Dogs: Distemper, hepatitis, leptospirosis, parvovirus and rabies. Cats: Feline infectious enteritis, feline leukaemia, cat flu and rabies.